World View representatives set up the balloon and parafoil for the record-setting flight. Image released on Feb. 20, 2015. A private company that aims to send tourists to the edge of space in a balloon broke a record Friday, flying a parafoil higher than anyone has before. 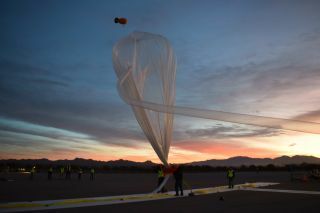 The Arizona-based company World View sent the parafoil 102,200 feet (31,151 meters) into the air during a test flight Friday (Feb. 20), according to representatives with the organization. That is the altitude that officials hope to fly passengers to when the company starts sending people to the edge of space and back, World View added. World View set a record for the highest parafoil flight on Feb. 20, 2015. World View plans to provide flights to the edge of space for $75,000 each — high enough for tourists to see the curvature of the Earth and a black of sky. The company also announced a partnership with United Parachute Designs (as well as Performance Designs) to "design and build an advanced descent system capable of returning payloads of increasingly higher masses." While the balloon had no people on board, it did include two university science experiments. One was from Montana State University to test high-definition video and computer equipment at high altitudes, to prepare for the 2017 United States eclipse. Also, the University of North Florida measured ozone gas using an experimental nanocrystalline gas sensor. Last year, World View said it plans to launch customers in 2016. There is competition, however; XCOR Aerospace is creating the Lynx suborbital rocket plane (which carries one passenger) and Virgin Galactic plans flights using SpaceShipTwo, a six-passenger suborbital spaceliner. XCOR plans powered test flights later this year. Virgin Galactic suffered a tragic setback last year when its SpaceShipTwo crashed during a test flight, killing one co-pilot and sending the other to hospital.